I saw this in a recent Triablogue post. But the Battles version of Institutes footnotes this statement, [among other references] to “John Eck, Enchiridion (1553), ch i., fo. 4a-6b”. Now, it’s true that Eck was not an “official” source of Roman teaching at the time, but one might assume that, given his position as a papal emissary, he’d be a pretty good source. Someone might also suggest that Calvin has misrepresented what Eck was saying, but that’s not likely. First, Calvin was fairly scrupulous about getting his opponents arguments correct. And second, Battles himself translated the Eck document from which he cites. I’m not going to spend the $35.00 at this point to see what Eck says. But I’d be willing to surmise that Battles wouldn’t have spent the time translating this work if there weren’t something in it that he wanted to show. Well, I spent the $35.00 to see what Eck says. In fact, at the time, I think I spent more than $35.00 to see what Eck says. I scanned the following text in quickly, so there may be some typos. This is from the translation of Eck by Battles, pages 11-17. One quick comment. It was not Calvin citing Eck in I, 7:1. Rather, it was a footnote Battles confirming Calvin's comment by citing Eck and others. 1. The authority of Scripture is greater than that of the Church. For the Church ought to be ruled according to Scripture. For the Word of God yields to no one. 2. It is not lawful for either the Church or any man to go against Scripture. 3. One does not say that what the Pope with the Cardinals and the bishops determines has been determined by the Church, because the Church is the congregation of all believers and the connection in true faith by which the just man lives. 4. The Church of God is in the Spirit alone, because she is believed, and thus hidden. 5. Luther says that he is of the Church, and believes the Church is with him, where he is preacher. So also Zwingli, Carlstadt, Pelican, Soblerus, Hubmaier Pacimontanus* etc. 1. Christ did not write any book, nor did He bid the disciples or apostles to write one, yet He gave many precepts concerning the Church; hence when about to send apostles out to plant the Church, He did not say, "Go write," but "Go into the whole world and preach the Gospel to every creature" [Mt. 24:14]. Therefore the law was written on tablets of stone, but the Gospel on hearts. "Since you are a letter of Christ, sent out by us, and written not with ink but with the Spirit of the living God, not in tablets of stone, but in the physical tablets of the heart" [2 Cor 3:3]. Jeremiah agrees: "Behold, the day is coming, says the Lord, and I will make a new covenant with the house of Israel,and with the house of Judah, not like the covenant I made with your fathers, etc., but this will be one which I shall make with the house of Israel after those days, says the Lord; I shall give my law in their inward parts, and in their heart I shall write it, and I will be their God and they will be my people" [Jer 31:31-33]. Jerome: Why is it necessary to take into one's hands what the Church does not receive? 2. The Church is older than Scripture, for when the Apostles began to preach, there was no written Gospel, no letter of Paul, and yet there was the Church dedicated by Christ's blood. Thus the apostles without the Scripture of the New Testament chose Matthias [Acts 1:22ff], ordained seven deacons [Acts 6:3]; Peter caused Ananias and Sapphira to die [Acts 5:lff]. Even though the apostles were very diligent in sowing the Word of God, yet very few things are found written by them. It follows logically that they taught many more things than they wrote; the things taught have equal authority with the things written. 3. Scripture is not authentic without the Church's authority: for the canonical writers are members of the Church. Hence against a heretic wishing to contend against the Church's constitution and custom one objects with the very weapons whereby he wishes to contend against the Church. He is going to quote the canonical Scriptures of the four Gospels, and the Pauline Epistles. Let the objection immediately be raised against him: how does he know that these Scriptures are canonical except from the Church, for why does he believe the Gospel of Mark, who did not see Christ, to be canonical, and not the Gospel of Nicodemus, who saw and heard Christ, as John testifies [Jn 3:lff]? So why has the Gospel of Luke the disciple been received, and the Gospel of Bartholomew the apostle been rejected, unless we humbly confess the authority of the Church with the Blessed Augustine, something Luther sometimes taught, that the Church could judge concerning the Scriptures. Therefore it thus is clear that the Church is older than Scripture, and Scripture would not be authentic without the Church's authority. Hence, Augustine, Against the Epistle Called Fundamental, 5.6 [PL 42.176]: "I would not have believed the Gospel unless the authority of the Church5had moved me to do so." More below on Scripture at Chapter 4.
i. Scripture teaches: "Remember to hallow the Sabbath day; six days shall you labor and do all your work, but the seventh day is the Sabbath day of the Lord your God," etc. Yet the Church has changed the Sabbath into Sunday on its own authority, on which you have no Scripture. ii. Christ said to His disciples on the mountain: "I have not come to abolish the law but to fulfill it" [Matt 5:17]. And yet the Church of the apostles in council boldly made pronouncement on the cessation of legal matters. iii. In the final chapter of Matthew, Christ said to the disciples: "Go therefore and teach all nations, baptizing them in the name of the Father, and of the Son, and of the Holy Spirit, teaching them to observe all things whatsoever I have commanded you" [Matt 28:19f]. Here Christ gave the form of baptizing ex plicitly in the name of the Trinity, and yet the primitive Church changed this form of baptizing to in the name of Christ Jesus." "Repent," says Peter, "and let each one of you be baptized in the name of Jesus Christ in forgiveness of your sins" [Acts 2:38].2 And in Acts 8 [:12] it is said that the Samaritans were baptized by Philip in the name of Jesus. And in Acts 19 [:5]: "When these things were heard they were baptized by Philip in the name of Jesus," that is, by Paul. strangled" [v. 29]. This matter, so clearly defined and expressed,the Church by her authority changed, because she uses both blood and strangled meat. Note the power of the Church over scripture .5 See below, Chapter 13, On Human Constitutions. v. Now if you wish to live more according to the scriptures than according to the authority of the Church, now all the Jews coming to baptism would be held to the law of Moses, for thus they would find in the Scriptures that apostles and other converts have lived. James and the elders spoke to Paul returning from the Gentiles: "See, brother, how many there are among the Jews who have believed, and all are emulators of the law. Moreover, they have heard of you, that you teach all the Jews that are among the Gentiles to forsake Moses, saying that they ought not to circumcise their children, nor to walk according to their custom. What is it therefore? The multitude must needs come together, for they will hear that you have come. Do therefore this which we say to you. We have four men that have a vow on them; having taken them, purify yourself with them, and be at charge for them, that they may shave their heads, and all shall know that there is no truth in the things about which they had been informed concerning you, but you walk and yourself keep the law. Moreover, concerning those of the Gentiles who believed, we have written, adjudging that they should keep themselves from idols, from what is sacrificed, from blood and what is strangled, and from fornication" [Acts 21:20-25]. Here, Paul, with many thousands, kept at one behest of the law of St. James. Would you, 0 Luther, converted from the Jews today, rather live according to those scriptures, or according to the authority of the Church? We confess the Church to be the congregation of all the faithful who are of the body of Christ, and when primates and leaders of any province decide anything, the whole province is said to have decided it. Thus the prelates of the Church are called "the Church," because they represent her and their subjects. Otherwise the Church could never be gathered. "But if he does not hear you . . . tell the Church; but if he does not hear the Church, let him be to you as a Gentile and publican" [Matt 18:16f]. According to Luther's view, if anyone wanted to tell the Church, he would have to traverse the whole earth. Chrysostom [Hom. in Mt, 60.2: PG 58.586] explains: "It clearly refers to the prelates that is, presidents, because he will soon give the power of binding and loosing to the apostles as prelates." "If you perceived a case before you difficult and ambiguous to judge, between blood and blood, between cause and cause, between leper and non-leper, and you saw the judgment to be a matter of controversy within your gates: rise up and go up to the place which the Lord your God has chosen and come to the priests of the tribe of Levi, to the judge that shall be in those days, and inquire of him, who will judge the truth of the judgment for you, and you shall do what they say, who are in charge of the place the Lord has chosen, and they will teach you according to his law, and you will follow their decision, and turn aside neither to the right nor to the left. But he who in his pride refuses to obey the authority of the priest, who is at that time ministering to the Lord your God, that man will die by the decree of the judge, and you shall remove the evil from Israel, and all the people hearing it will fear, so that none shall henceforth be swollen with pride" [Dr 17:8-13]. See the power of the priest under the law. How much more power do you think the priest under the Gospel has, and ponder the penalty of the disobedient. "And when Paul and Barnabas had no small dissension against them, the brethren decided that Paul and Barnabas and certain others of them should go up to the apostles and presbyters in Jerusalem about this question" [Acts 15:2]. See how the Deuteronomy c. 17 passage was fulfilled. And what was the Church? Not the whole congregation, but they went up to the apostles and presbyters who represented the Church. 4. If the Church is hidden, how did Christ enjoin the telling it to the Church, and if he did not hear the Church, etc. But if it were hidden, what could be said to it, or how would it hear? Likewise the Church is the body of Christ, and the Christians are its members [Rom 12:5; 1 Cor 10:17; 12:12; Eph 1:23; 5:30; Col 1:24]. Let Luther say whether they were hidden and only mathematically the Church, when Paul said: "Now you are the body of Christ, and members each in his part" [1 Cor 12:27]. It is the way of heretics to have caverns and caves and lurking places: the Church puts the lamp upon a lampstand[Lk 8:16]. The Church is shown to you in councils, in the Apostolic See, in bishops and leaders of individual Churches. For if the Church were only mathematical, the brother of Paul (Timothy) would not have praise through all the. Churches [2 Cor 1:1]. David would not have said: "With you is my praise in the great church" [Ps 21:26], "and in the seat of the elders let them praise him" [Ps 106:32]. For this see Augustine on the First Epistle of John, the first tractate at the end. 5. What Luther says, all the heretics have said. Accordingly Augustine inveighs against the Donatists, who wanted to confine the universal Church to the cornerstone of a few heretics. See more in Johann Cochlaeus, On the Authority of the Church , and John Fisher. Among the older writers see Juan Torquemada,3who wrote extensively on behalf of the Church. • 1. Christ did not write any book, nor did He bid the disciples or apostles to write one, yet He gave many precepts concerning the Church; hence when about to send apostles out to plant the Church, He did not say, "Go write," but "Go into the whole world and preach the Gospel to every creature" [Mt. 24:14]. As if Sola Scriptura forbids “preaching the Word,” which the whole church (not just the apostles) did. (Acts 8:4; 11:19) and the magisterium, rather than Scripture providing for both, but as under Scripture. And the message being preached was of One who was “rejected of the elders, and of the chief priests, and scribes,” (Mk. 8:31) who, like RCs, challenged His authority on the basis that being the recipient of Divine promises of presence, guidance and perpetuation, and having historical decent (Lv. 10:11; Dt. 4:31; 17:8-13; Is. 41:10, Ps. 89:33,34; cf. Mt. 23:2 etc.) gave them indisputable authority. Sounds familiar. And as cults do, Rome autocratically defines not only herself as assured infallible, but that only her interpretation of purported evidences for her claims can be assuredly true. But the Itinerant Preacher established His claims upon Scripture, as did the apostles and early church, (Mt. 22:23-45; Lk. 24:27,44; Jn. 5:36,39; Acts 2:14-35; 4:33; 5:12; 15:6-21;17:2,11; 18:28; 28:23; Rm. 15:19; 2Cor. 12:12) in text and in the power it affirms being given to its Truth. And thus the NT directly references the Old about 275 times, with about 600 allusions, according to one count To the glory of God. • 2. The Church is older than Scripture,..It follows logically that they taught many more things than they wrote; the things taught have equal authority with the things written. Singer would love this one. Meaning that Scripture is only one Testament, and that being the instrument and steward of Holy Writ and having historical decent requires or assures such that stewards are assuredly infallible, and whose interpretation all must follow. Thus all should have submitted to the Jews. • i. the Church has changed the Sabbath into Sunday on its own authority, on which you have no Scripture. • ii. the Church of the apostles in council boldly made pronouncement on the cessation of legal matters. As commanded in Scripture, with the “lest esteemed” doing so in civil disputes. (1Cor. 6:4) But in those and in doctrinal matters Scripture remains the supreme authority, not the church as possessing formulaic assuredly infallibility as per Rome, so that she is infallible whenever she speaks in accordance with her scope and subject-based criteria. • iii. [Matt 28:19f]. Here Christ gave the form of baptizing explicitly in the name of the Trinity, and yet the primitive Church changed this form of baptizing to in the name of Christ Jesus." Now he supports the UPC! That's what sola ecclesia apologetics leads to i suppose. Instead, it is by Scripture that we see both forms, if indeed there are two, and it is one thing for Divinely inspired writers to give us the Scriptural interpretation of the gospels, and another for a church to autocratically presume they are as the inspired writers whenever they speak according to their formula. There is nothing over Scripture here, as instead, this New Covenantal change was affirmed in the light of Scripture in text and the attestive power it provides for, and the decree that the Gentiles abstain “from pollutions of idols, and from fornication, and from things strangled, and from blood” (Acts 15:20,29; cf. 21:25) was itself based upon Scripture. (Gn. 35:2; Ex. 34:15-16; Ezek. 30:30,31; Gn. 34:1,2,31; Dt. 22:28,29; 2Chron. 21:11; Gn. 9:4; Lv. 7:27; 17:13,14) Idolatry is the mother of sin, and “pollutions of idols” refers to a multitude of things, including eating things sacrificed to idols as part of worship to fornication, but which is unconditionally condemned. The prohibition of “things strangled” is derived from the prohibition against consuming blood. This decree did not set a limit on the specific obedience enjoined upon Gentiles, but provided fundamental laws while absolving them from adherence to all of the ceremonial law. Rather, this examples how mistaken church leadership, even by good men, can be. This advice and attempt at an admixture of law and grace almost got Paul killed. Rather what Eck's conveys, these thousands were all zealous of the law,” and were more like Paul in his unconverted state. • [Dr 17:8-13]. See the power of the priest under the law. How much more power do you think the priest under the Gospel has, and ponder the penalty of the disobedient. Indeed, look at the Cross and see what happens when they presume such assured veracity! While the Lord upheld the validity of their authority, (Mt. 23:2) He made it clear it was not autocratic or assuredly infallible, but was subject to reproof by Scripture, and that God could raise up men from without to reprove them. And thus there was John the Baptist and the Lord and the church, but which in the case of Rome it has become like the Jewish leadership. • 4. If the Church is hidden, how did Christ enjoin the telling it to the Church, and if he did not hear the Church, etc. 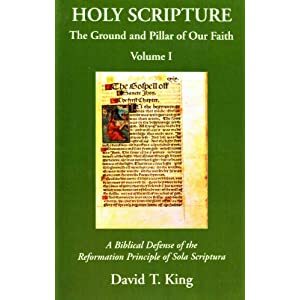 As if Sola Scriptura excluded the magisterial office, rather than judging and disciplining by Scripture, which Rome does little of. Meanwhile who is hidden? Historically SS evangelical type churches and believers have been the most manifest relative to their numbers, while Roman Catholicism has are among the lest manifest believers until their funeral, as they trust Rome to gain the most nominal members — and most are liberal — eternal life. And the answer for those seeking a true church is to look to the Jesus of the Scriptures, which the early church did, (Acts 17:2; 18:28; 28:23, etc. ), and to men who hold Scripture to be the assured Word of God and transcendent standard for obedience and testing and establishing truth claims, in text and in power, which it is abundantly evidenced . Indeed, and thus historically it has been the Sola Scriptura - type evangelical church that has most manifested that it is the church of the living God, (1Tim. 3:15) and consistent with Scripture, has been the most persecuted, sometimes wandering in deserts, and in mountains, and in dens and caves of the earth " (Hebrews 11:38) versus its institutionalized counterpart who exalts herself as supreme, with her ostentatious pomp and ceremony and papal palace, while being the greatest religious persecutor after Islam. • 5. What Luther says, all the heretics have said. Rather, the greatest heretic is the “church” that infallibly declares only her interpretation can be right in any conflict, and under such presumption often teaches for doctrine her unwarranted extraBiblical “tradition of the elders,” (cf. Mk. 7:3-16) while under sola ecclesia, which Rome shares with cults, are seen the most manifest doctrinal errors. The emperor has no more clothes now than in the time of Luther. Without knowing Eck’s larger context, I will say, based on this selection, that John Eck should have simply given an “Amen” to “objections” 1 and 2. BTW, what is your opinion of John Fisher who is mentioned here? I came across him being reference on another RC hit piece on Luther (http://www.cfnews.org/page88/files/58d74e2e0be923359430e769524c345f-645.html), but which mostly cites O'Hare.